Selling Smarter Training Material for training sales is designed for trainers to develop the sales team in the work force. Confidently develop strong selling skills, learn the sales cycle, professionalism, the ten major mistakes of sales and more! Seeing is Believing This sample manual to teach Selling Smarter is in MS Word format. Sales is a lot like chess: even if you know the rules, and how to navigate the board, you need to play repeatedly to become skilled at it. And, although the more effort we put into sales, the better our results can be, there are always ways to improve. 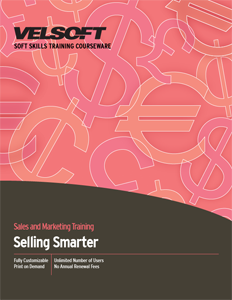 Velsoft's sales training teaches participants how to make the most of the effort they put into their sales relationships. Participants are taught the best sales techniques and customer-focused selling, how to develop and achieve the goals they want, how to successfully apply the best and most effective sales techniques to suit their personal approaches, how to network, and how to maximize the use of their time. Selling Smarter Training Materials makes teaching sales skills simple for instructors: it includes a fully customizable instructor's guide, course assessments, and lesson plans, in addition to self-study and quick reference guides for employees. Velsoft's training material is also available through our eLearning website, which can be used to integrate the benefits of classroom-led material and mobile learning in a blended learning platform.